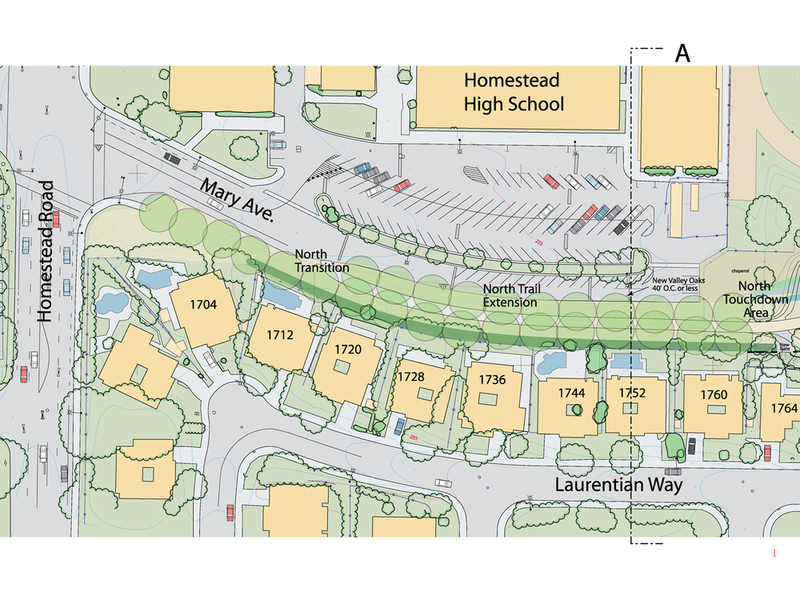 Steven Grover & Associates led a dream team of design professionals to a successful schematic design solution for a long-span bridge and trail design challenge involving a complicated and controversial juxtaposition of land uses in Cupertino, California. The centerpiece of the project is an elegant main-span structure which evokes the catenary forms of nearby power lines, and curving path alignments that provide open sightlines, yet deter high cyclist speeds. The bridge spans 325 feet over 8 freeway lanes, shoulders, on- and off-ramps, as well as a storm drain channel. A key design challenge for this project is that the approach pathways overlook private residential backyards. SGA’s low profile suspension bridge and landscape design provided a sensitive response to this important adjacency condition in four ways: 1) the thin deck of the long span structure allows the approach pathways to be shorter and thus remain more distant from residences, 2) the plan geometry incorporates a straight and shortest-span alignment over the freeway for economy and structural efficiency, but gentle curves at each end to pull the pathway away from residences, 3) undulating retaining walls on each side create the backbone of a landscape buffer between the public and private land uses while also providing a graceful interplay with the pathway and planting zones, 4) the planting design allows for scenic vistas but limits visual and physical access to restricted buffer areas. It also creates a pleasant park-like environment while formally reinforcing a sense of movement to deter loitering or repose. A key innovation of SGA’s design was in using these undulating retaining walls not only as a landscape element, but also as a very efficient backspan anchorage system for the main suspension cables. Normally, the high cost of anchorages for suspension bridges is the main reason why cable-stayed designs are favored. In this case, detailed cost estimates indicated that a lower profile suspension bridge would actually result in lower costs than a cable-stayed design.